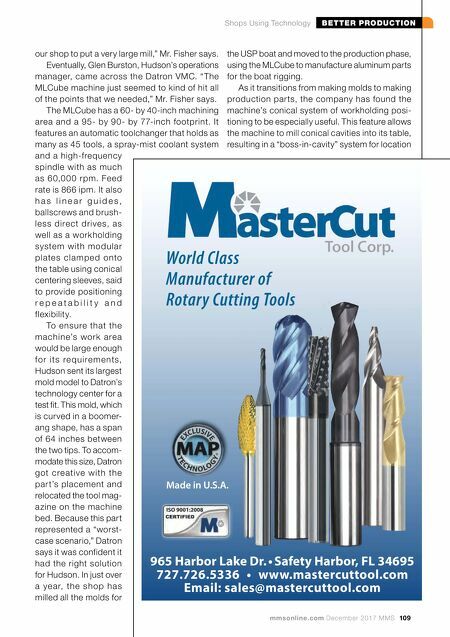 BETTER PRODUCTION Shops Using Technology 108 MMS December 2017 mmsonline.com The JUNKER Group is the ultimate partner worldwide for all needs related to grinding and air filtration technology. Maximum precision and absolute passion for what we do makes us a pioneering technology leader. It is our mission to set new standards and justify the trust placed in us by discerning customers from a vast array of industrial sectors. PARTNER FOR PRECISION INNOVATIVE PRODUCTION GRINDING SOLUTIONS +1 847 488 0406 info@junker-usa.com 2541 Technology Drive, #410 Elgin, IL 60124 USA ERWIN JUNKER MACHINERY, INC. www.junker-usa.com "We have a fairly large three-a xis CNC router that does all of the trimming for the boat hulls and all of the edge profiling of the boats," he says, "but it doesn't have the accuracy needed for moldmaking." The company began searching for a new CNC machine, but soon realized it had some challeng- ing requirements. 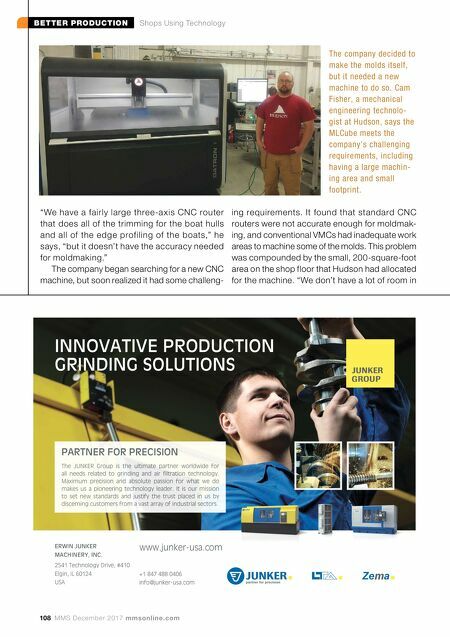 It found that standard CNC routers were not accurate enough for moldmak- ing, and conventional VMCs had inadequate work areas to machine some of the molds. This problem was compounded by the small, 200-square-foot area on the shop floor that Hudson had allocated for the machine. "We don't have a lot of room in The company decided to make the molds itself, but it needed a new machine to do so. Cam Fisher, a mechanical engineering technolo- gist at Hudson, says the MLCube meets the company's challenging requirements, including having a large machin- ing area and small footprint.